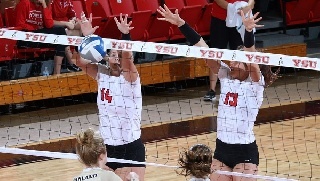 The Youngstown State volleyball team dropped a competitive four-set match to Akron on Saturday in its final match of the 2017 Penguin Invitational, presented by Courtyard Marriott Canfield. Two of the sets went beyond 25 as Akron prevailed 28-26, 25-19, 18-25, 26-24. Marketa Plesingrova posted a team-high 12 kills, and fellow freshman Margaux Thompson led the squad with 16 digs. Thompson was YSU's representative on the all-tournament team, finishing the weekend with 53 digs and 34 kills in three matches. Sarah Varcolla added nine kills and seven blocks, and Morgan Tippie boasted six blocks for the Penguins, who finished with 10 blocks as a team. Four Akron players finished with double digits in kills, and Kayla Gwozdz led all players with 18 kills. Fort Wayne went undefeated on the weekend, and Youngstown State, Saint Francis U and Akron each won one match. Neither team led by more than two in the first set, and Youngstown State had a pair of set points at 24-23 and 25-24 before Akron prevailed. The Zips then built a 7-2 lead early in the second set en route to take a 2-0 lead in the match. Youngstown State hit .357 behind six kills from Plesingrova in the third set to extend the match, and the Penguins led 21-18 after a 5-0 run in the fourth. Akron tied the score at 22, and YSU had a set point at 24-23 before the Zips held on. Youngstown State will begin conclude its non-conference schedule next weekend at the Toledo Blue/Gold Invitational.